More than sixty years have passed since the end of the second World War, since the world would realize the devastation that befell the Jews of Europe. They would eventually see the horrific photographs that were taken in the Nazi concentration camps soon after their liberation. They would be forced to come face to face with the scope of the ruination of the Jewish population of Europe and the realization that Jewish life there would never be the same. What remained of the Jewish population that once numbered more than nine million when Hitler first came into power in 1933, was whittled down to less than a third of that number by the end of the war. Though a very small percentage of the Jews who survived the war decided to stay in Europe, many chose to emigrate, hoping to start a new life in countries such as the United States, Israel (then Palestine) and other countries throughout the world. The Jews who did remain in Europe were forced to live amidst the rubble of the destruction of their towns. Many of their institutions, e.g. their town's synagogues and holy cemeteries, were leveled. Like so much of the physical world that then surrounded them in post-war Europe, their emotions and spirit were often shattered as well. So many families were torn apart or displaced. How could anyone recover from such a traumatic event as the Holocaust and reconcile their memories of the war, the destruction of their towns and communities, their way of life, and the senseless loss of so many family members and friends at the hands of the Nazi beasts? How would the survivors of the Holocaust remember what had occurred? Surely they could never forget-- such horrors become forever etched in one's memory. Where could they possibly reestablish their communities and begin anew? Certainly not in the areas of devastation. For the Jews who chose to remain in Europe after the war, who returned to the town they once lived in, their survival was not always secured. Most Jews decided to rebuild their lives elsewhere. It would not be until many years later that many of them would return to visit the countries in which they once lived. So many others swore that they would never return to the countries of their birth. The ones who did return would find that, for the most part, few if any Jews remained; the synagogues, the Jewish schools, the other institutions that were once so much an integral part of their community and way of life were gone. The homes they once lived in were occupied by others; the building that once housed their beloved synagogue was being used for a different purpose or lay in ruin. Many Jewish cemeteries were either destroyed during the war or vandalized. Their matzevot (gravestones) were toppled; many had been removed and used as paving stones for floors or roads. In the early thirties, before the war, the countries of Europe had very large Jewish populations. 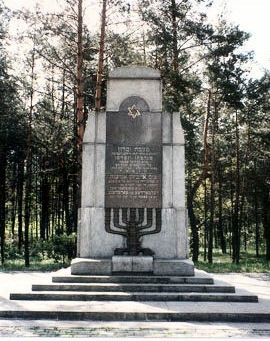 Many Jewish families resided in small towns or shtetls and lived their lives apart from the general population, according to Jewish law and traditions. They often made up a large percentage of a town's population and were important to the community. They were merchants who sold from the pushcart during market day, or may have greeted their customers from a store within the town square. They were also tailors, cobblers, teachers, students of the Torah, religious men. They were our zaidas, bobes, yiddische mames and tates, mumes, feters, shvesters and bruders--our mishpacha. This exhibition is dedicated to all those who perished in the Holocaust. Each of the memorials on display here was erected in Europe since the end of World War II. They are especially unique when compared to those in other countries such as the United States. The memorials of Europe were often built in the areas where the actual devastation, the mass killings took place; those in the United States were generally built by survivors or their first generation who at the time lived in relative safety thousands of miles away. Many of the European memorials were commissioned and paid for by local town governments, others by Holocaust survivors, some by both. The memorials in the United States were paid for my landsleit, members of a particular society that was formed by immigrants who came from a particular town in Europe. Particularly in Eastern Europe, relatively few Jews remained after the war, so these memorials today are mostly seen by those of us who choose to visit them, or by those who aren't Jewish. They are situated in countries such as Poland, Lithuania, Belarus and the Ukraine, Latvia, Hungary, Germany and Romania. For many of us, there are questions to be pondered. In the absence of a recognizable Jewish population in their town, and considering the possibility that they have never met a Jewish person before, how are those now living in these towns affected by such symbolic sites? 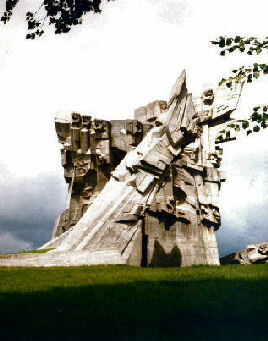 How do these monuments remind them of the horrors of World War II? Does the presence of these memorials motivate them to think more deeply about what had transpired during the war, and do they bereave and mourn for all the Jews who were lost in such insanity? Do they decry the horrors of war and genocide and begin to wish and work for a more peaceful world? It seems that many living in Eastern European countries today, who had always believed that they were Christian, are now discovering that they were born to Jewish parents and given to a Christian neighbor during the war so that they would not be killed. Others realize that Jews have contributed a great deal to their culture, and that the loss of so many has seemed to delete this contribution, leaving a gap in the history of their own town or country. One can only hope that the world will be a more peaceful place, and that these many memorials to those who perished in the Holocaust will be a constant reminder to all of us of the deleterious effects of intolerance, prejudice and war.